Neena Shilvock draws inspiration from nature, photographs and multi-hued imagery to create Capricious Jewellery, her label that caters to all tastes and moods. a�?I design for the woman who needs jewellery to match her different moods on different days,a�? says Shilvock who will be showcasing her latest collection at Rain Tree next weekend and conducting a workshop this Saturday. Brought up in Bangalore but settled in the UK, her expertise extends to wirework, precious metal clay and polymer clay pieces. 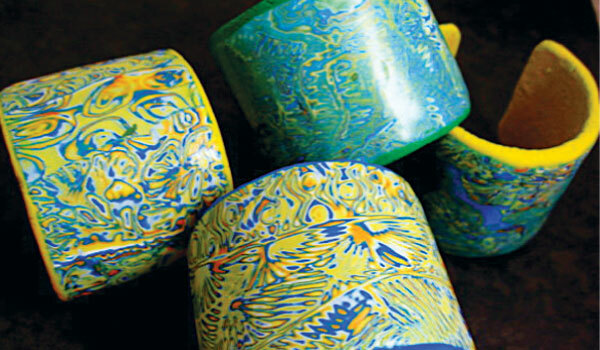 While wirework involves cold connection and no soldering whatsoever, precious metal clay is eco-friendly and polymer has a mouldable colour that lends itself beautifully to contemporary designs. a�?Although jewellery tends to be seasonal, for example pastels for spring, etc, I keep to what attracts my eye and my design ethic,a�? Shilvock shares. Beading itA�While she sources her beads and stones from around the world, she has a preference for hand glass beads from small-time artisans, which she believes can often be as expensive as precious stones. Her Tribal Bling range has elaborate pendants from Afghanistan combined with polymer clay beads hand-crafted by Shilvock herself in her kiln. In shades of red and blue, a few pieces also use the rudraksha beads, offering more depth and variety. 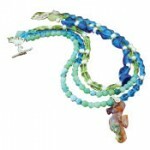 Sea lovers can choose from her range of ocean-inspired pieces that combine shades like aqua, jade, bottle green and coral. We quite liked the Dragonfly Dreams necklace which features multiple strands of Czech glass beads in burnt sugar and grape, studded with stardust silver tone beads, dragonflies and stylised hearts. 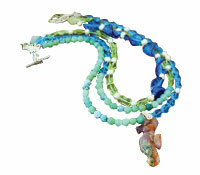 Closure is provided by a dragonfly toggle clasp with a dangling heart, all crafted by Shilvock.